Since 1999 he is working at the Department of Applied Mathematics of the National Technical University KhPI. He got a position of the associate professor at the Department of Applied Mathematics in September, 2002. V.N. Burlayenko teaches the course of higher mathematics at the different faculties of the University such as “Business and finances” and “Organic Substances Technology” (in English), “Integrated technologies and chemical engineering”, “Engineering-and-Physical faculty”, “Energy-engineering” and others. He received his M.Sc. degree (diploma with honor) in the field of Dynamic and Strength of Machines from the Kharkiv Polytechnic Institute (current National Technical University KhPI) in 1993. He defended his Ph.D. in Solid Mechanics (specialty number is 01.02.04) at the A.N. Podgorny Institute for Mechanical Engineering Problems of the National Academy of Sciences of Ukraine in 1999. The title of his doctor degree’s work was “Elaboration of methods for high-temperature creep and damage predictions of thin-walled structural elements at cyclic loading“. In 2005 he earned the scientific title of Associate Professor of the Department of Applied Mathematics of the National Technical University KhPI. The field of his scientific interests: Nonlinear Mechanics of Creep and Damage, Nonlinear Dynamics taking into account Contact and Friction phenomena, Structural Analysis of Modern Composite Materials, Finite Element Analysis and Simulations: implicit and explicit codes, Programming. In 1999 and 2003 he was twice awarded by the grant of Cabinet of Ministers of Ukraine for young scientist. In 2000 and 2003 he got international scientific grants awarded by DAAD (German academic exchange service) and INTAS–Young (International organization for assistance of collaboration with scientists from former countries of USSR). He took part as an expired researcher in two international scientific projects financed by Sixth (FP6) and Seventh (FP7) Framework Programme of European Union in 2008 and 2010, respectively. In 2015, V. N. Burlayenko received a grant of the German Research Foundation (DFG) for three-month research at the Otto von Guericke Magdeburg University, Magdeburg, Germany, and in 2015-2016 he was invited for 10 months as an Academic Visitor within the Erasmus Mundus ACTIVE program post-doc exchange at the University of Southampton, Southampton, England. V.N. 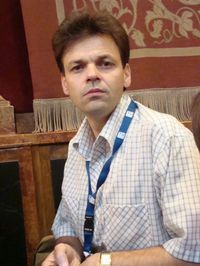 Burlayenko is an author or co-author of more than 70 publications in scientific journals and conference proceedings and has 2 textbooks with co-authors. He takes an active participation in international scientific conferences, congresses and seminars. V. N. Burlayenko has a membership in several international scientific societies – the German Society of Applied Mathematics and Mechanics (GAMM) as well as the European Society of Mechanics (EUROMECH) . Burlayenko V.N., Altenbach H., Sadowski T., Dimitrova S.D., Bhaskar A. Modelling functionally graded materials in heat transfer and thermal stress analysis by means of graded finite elements. Applied Mathematical Modelling 45 (2017) 422–438. Burlayenko V.N., Altenbach H., Sadowski T., Dimitrova S.D. Computational simulations of thermal shock cracking by the virtual crack closure technique in a functionally graded plate. Computational Materials Science Volume 116 (2016) 11–21. Burlayenko V.N., Altenbach H., Sadowski T. An evaluation of displacement-based finite element models used for free vibration analysis of homogeneous and composite plates. Journal of Sound and Vibration 358(8) (2015) 152-175. Burlayenko V.N., Sadowski T. Transient dynamic response of debonded sandwich plates predicted with finite element analysis. Meccanica 49(11) (2014) 2617-2633. Burlayenko V.N., Sadowski T. Nonlinear dynamic analysis of harmonically excited debonded sandwich plates using finite element modelling. Composite Structures 108 (2014) 354–366. Burlayenko V.N., Sadowski T., Modeling of the dynamic debonding growth of sandwich plates // In: Proceedings of the 4th International Conference on Nonlinear Dynamics ND-KhPI 2013, June 19-22, 2013, Sevastopol, Ukraine, Yu.V. Mikhlin and N.V. Perepelkin (eds.) ISBN 978-617-669-100-6, pp. 225-230. Burlayenko V.N., Sadowski T. Finite Element Nonlinear Dynamic Analysis of Sandwich Plates with Partially Detached Facesheet and Core. Finite Elements in Analysis & Design 62 (2012) 49–64. Burlayenko V.N., Morachkovski O.K. Finite element model of nonlinear dynamics of continuum with a breathing crack. Bulletin of the National Technical University ‘Kharkiv Polytechnic Institute’, Mathematical Modeling in Engineering and Technology, N 2, – Kharkiv, 2012, p. 44–51. (in Ukrainian). Burlayenko V.N., Sadowski T. A numerical study of the dynamic response of sandwich plates initially damaged by low velocity impact. Computational Materials Science 52(1) (2012) 212–216. Burlayenko V.N., Morachkovski O.K. Using kinematical contact algorithm with explicit time stepping for finite element predictions of dynamics of continuum with a crack. Bulletin of the National Technical University ‘Kharkiv Polytechnic Institute’, Mathematical Modeling in Engineering and Technology, N 54 (960), – Kharkiv, 2012, p. 19–25. (in Ukrainian). Burlayenko V.N., Sadowski T. Dynamic behavior of sandwich plates containing single/multiple debonding, Computational Materials Science 50 (2011) 1263–1268. Burlayenko V.N., Sadowski T. Numerical modeling of sandwich plates with partially dedonded skin-to-core interface for damage detection// In: Proceedings of the 8th International Conference on Structural Dynamics EURODYN 2011, 4 – 6 July 2011, Leuven, Belgium, G. De Roeck, G. Degrande, G. Lombaert, G. Muller (Eds.) ISBN-978-90-760-1931-4, p. 2242-2249. Burlayenko V.N., Sadowski T. Post-impact dynamic response of sandwich plates with foam and non-metallic honeycomb cores// In: Proceedings of the 7th European Nonlinear Dynamics Conference ENOC 2011, 24 – 29 July 2011, Rome, Italy, D. Bernardini, G. Rega and F. Romeo (Eds.) ISBN: 978-88-906234-2-4, 6 pages. Burlayenko V.N., Sadowski T., Nazarenko S.A. Numerical modeling of dynamics of sandwich plates with partially damaged facesheet-to-core interface// In: Contemporary problems of mathematics, mechanics and computing sciences, N.N. Kizilova and G.N. Zholtkevych (eds.) Publishing house PPB Virovec’ A.P., Kharkov, 2011, p. 13-25. Burlayenko V.N., Sadowski T. Dynamic analysis of debonded sandwich plates with flexible core – Numerical aspects and simulation. Advanced Structured Materials, Volume 15, Shell-like Structures, H. Altenbach and V.A. Eremeyev (eds.) Springer-Verlag 2011. Part V, pp. 415-440. Burlayenko V.N., Sadowski T. Effective elastic properties of foam-filled honeycomb cores of sandwich panels, Composite Structures 92 (2010), 2890–2900. Burlayenko V.N., Sadowski T. Influence of skin/core debonding on free vibration behavior of foam and honeycomb cored sandwich plates. International Journal of Non-Linear Mechanics 45(10) 2010 959–968. Burlayenko V.N., Sadowski T. Application of homogenization FEM analysis to aluminum honeycomb core filled with polymer. Wiley’s Webserver Wiley-InterScience in the PAMM, Volume 10, Issue 1, December 2010, p. 403–404. Burlayenko V.N., Sadowski T. FE Modeling of dynamics of impact-damaged sandwich plates with intermittent contact in detached fragments. In: Chapter 6, Monograph of Aspects of fracture and cutting mechanics of materials. Edited by J. Jonak, Lubelskie Towarzystwo Naukowe, Lublin 2010, pp. 71-79. Burlayenko V.N., Sadowski T. Numerical modal analysis of sandwich plates partially damaged due to impacts. In: Proceedings of 3rd International Conference Nonlinear Dynamics, ND-KhPI 2010, September 21-24, 2010, Kharkov, Ukraine, pp. 284-289. Burlayenko V.N., Sadowski T. Analysis of structural performance of aluminum sandwich plates with foam-filled hexagonal honeycomb core. Computational Materials Science, Volume 45, Issue 3, May 2009, p. 658-662. Burlayenko V.N., Sadowski T. Numerical studies of the dynamic behaviour of sandwich plates initially weakened by the impact damage. In: Proceedings of the 10th Conference on Dynamical Systems – Theory and Applications, DSTA-2009, December 7-10 Lodz, Poland, pp. 394-407. Burlayenko V.N., Sadowski T. Dynamics of sandwich plates weakened by single/multiple debonding. In: Proceedings of 18th International Conference on Computer Methods in Mechanics, CMM 2009, 18-21 May 2009, Zielona Gora, Poland, pp. 139-140. Burlayenko V.N., Sadowski T. Influence of skin/core debonding on free vibration behavior of foam and honeycomb cored sandwich plates. In: Proceedings of Euromech Colloquium 498 Nonlinear Dynamic of Composite and Smart Structures, May 21-24, 2008, Kazimierz Dolny, Poland, pp. 108-111. Burlayenko V.N., Sadowski T. FE modeling of delamination growth in interlaminar fracture specimens. Budownictwo i Architektura, Vol. 2(1), 2008, p. 95-109. Burlayenko V.N., Sadowski T. Finite-element free vibration and buckling analyses of sandwich plates with honeycomb and foam cores. In: Proceedings of the 2nd International Conference Nonlinear Dynamics, September 25-28, 2007, Kharkov, Ukraine, pp. 243-249.